Many thanks to The Cover by Brittany for originally hosting this post on her blog. 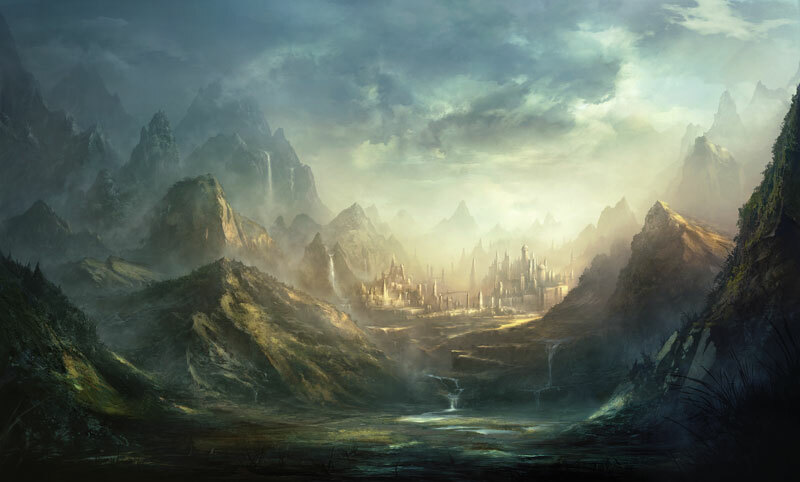 Some fantasy authors cringe at the topic of world-building, but actually, it’s one of the most thrilling aspects of writing genre fiction. When we write fantasy, we become the Maker of Worlds. We establish our world’s limitations, its physical barriers, and the triumphs and tragedies of its histories. Ultimately, as its creator, we can make our world any way we like. We can envision a world inhabited by a single race—like Endor or Pandora—or one of multiple races and kingdoms. No matter what type of world we’re creating, we have to know some things about it in order to be able to describe it to our readers. But how do we go about this monumental task? At the highest level, the world-building field can be divided into two camps. In Camp #1 we find the Engineers.They believe in establishing the entire world before they ever write a word of story. They use exhaustive lists of questions that explore a variety of topics in order to flesh out their world. If you enjoy D&D, Warhammer 40K and other games that involve detailed lists which must be compared with more detailed lists in order to a) set up the game and b) take a turn, Camp #1 is the approach for you. The Engineers enjoy establishing kingdom, country and empire, coming up with names of forests, rivers, towns and cities and examining their respective histories, their geographical boundaries, their ideologies and their economic products. They’ll easily spend days developing the relationships of the ruling monarchies and plotting their family trees and blood-feuds, and love every moment of it. As they work through these details, story ideas may come. To be sure, they’ll have a long list of kingdoms and character names to choose from by the end of this exercise. And probably some gorgeous diagrams and maps. But they’re not likely to have much of a story to show for all those invested hours. In Camp #2 dwell the Gardeners (the great Ruth Harris calls them pantsers). They simply start writing the story by the seat of their pants and see how it grows. “But a writer must know kingdoms and peoples and places before he can write about them!” you scream. So, these things in place, with the Gardener approach, we start writing. Our character is on a horse, so we name the horse if we care. He’s going to a town so we name the town. What our character sees and experiences while in town—the scene literally appearing in words on the screen as its appearing in our heads— establishes how large or small the town is, its relationship to nearby towns or cities, and the struggles and challenges faced by its inhabitants. We basically make these things up as we go along. So our character goes into a tavern. We sit for a moment and come up with a name for the tavern, deciding also in that moment that it is a pirate establishment, so we give all of the men inside nose piercings and wild black hair. They need some kind of history now, so we decide they inhabit an archipelago off the coast of this kingdom (or perhaps one far away, which changes entirely the reason they might be in that tavern). How much of the pirates’ experience we share fleshes out more of the world our protagonist lives in. Each new meeting or interaction offers a chance to provide a little more of the world’s varied history—to a) make it up right then, b) explain something we’ve already mentioned but refrained from delineating; or c) some information we had planned all along. Okay, we’ve left the pirates. Now our protagonist is off to the castle. Maybe we’ve had this part of the story mulling in our heads for days or months, or maybe it’s heading in a new direction since we met the pirates. With each new character we introduce, we also have the opportunity to develop and reveal more of our expanding world, its history and culture, and the conflicts that define the ideologies of its kingdoms. These story and character seeds can be sewn ahead of time (if we think of them), or sprouted on the spot. Is one approach more difficult than the other? It depends on our inherent mindset. For Gardeners, endlessly designing a world with no story is difficult and tedious. They need the story in order to flesh out the world. Conversely, the Engineers delight in this exercise and shy away from writing the story without a detailed blueprint from which to build. And then, as with most extremes, there are those of us who fall somewhere in between. Certainly, a little planning is beneficial, some fleshing out is good. Knowing the names of the surrounding kingdoms and at least their kings or queens (or ruling Empires) is helpful in framing the context of the tale. Ultimately, an approach is only as workable as it works for you. Wherever you fall on the world-building scale, it’s your world to create as you please, and that’s the magic of being a genre-fiction writer. What camp do you fall into? Or is there another camp altogether that should be represented here? Let me know how you approach world-building. I fall somewhere in between. The Ilvenworld is an engineered world, I know where the landmasses and oceans lie, I have a good grasp of its history and its various upheavals. That said, I also garden it as I go along. It’s a little bit like exploration, when much of the map is scrawled with pictures of sea monsters or warnings (“Here Be Dragons!”), and people “discover” what lies beyond their normal experience. But engineering the history of my world has thrown up so many plot ideas. Like a member of one of my exotic races – a sylph – taking the throne. Why did *that* happen then? From that my present series of books have poured forth and not stopped. Yes – I created the Ilvenworld for a completely different story! Sometimes we must let the pen lead. So, in fine, my world-building is a mixture of engineering and gardening. But above all, the world must feel real for it to work. And that *is* up to the novelist, whether engineer or gardener at heart. Thanks, Nicholas. Very good point on the world needing to feel real and the novelists responsibility in engendering that. The entire subject of creative inspiration fascinates me, especially how so many of us are the same and yet so different in terms of the sparks that drive us and the route we use to get there. I loved hearing about your process. I have certainly experienced that “what just happened?” moment when the character throws a punch and you’re left reeling or laughing, and ultimately resigned to go along with his/her wishes.